Home » Model Horse	» The Breyer 2017 Stablemate Club Is Now Open! The Breyer 2017 Stablemate Club Is Now Open! 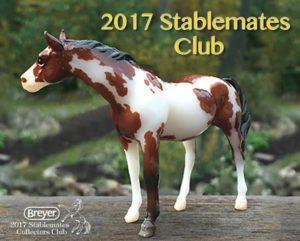 The Breyer 2017 Stablemate Club is now open to Collector’s Club members to join! There will be a Gambler’s Choice special run similar to Diesel, a clearwear decorator and a brand new sculpt by Maggie Bennett. I love Maggie’s work, Breyer can count me in the Stablemate Club for 2017! Maggie Bennett has sculpted so many lovely Arabians, I wonder if we might see a new Stablemate Arabian in 2017? The teaser picture is of Coco, a glossy bay pinto G1 Thoroughbred Mare. The Stablemate Club is $30 to join. $5 from the deposit will be applied to each of the 6 Special Runs bringing the cost to each Stablemate to $15 plus shipping. I believe that the International membership is shipped in batches to make the cost of shipping for reasonable. Will you be joining the 2017 Stablemate Club??? The Club will have six releases, one every other month, and will include a Gambler’s Choice (you’ll receive one of four colors, randomly selected), a clearware decorator and a brand new sculpture by Maggie Bennett! These detailed new pieces are exclusively available to Stablemates Collector’s Club members only, so don’t miss out! 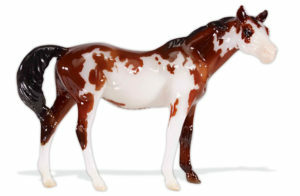 In addition to the great models, members will also receive insider information, and the opportunity to enter a raffle for a unique Stablemates collectible! Join by 11:59pm EST, 12/31/16! Each model is only $20, and is shipped to your home in a satin drawstring bag with Club logo. To join, you must have a valid Collector Club membership purchased on or after July 1, 2016, and sign up by December 31, 2016 with a non-refundable deposit of $30. We’ll deduct $5 from each model when it ships, so you pay $15 per model (plus S&H). This program is a continuity club which means you are obligated to purchase all six models. First Shipment for US members is in January 2017, with subsequent shipments every other month. You must purchase an international club membership if you are shipping outside the US.